Facilities layout for alpaca farms differ somewhat from other livestock. You'll want to do lots of research and think through the workflow before finalizing details. Below are a few important tips that you might not be aware of when laying out your farm and preparing for your new alpacas. Because alpacas are herd animals who are such efficient eaters, you'll see that most farms have many smaller paddocks as opposed to larger pastures. This keeps the alpacas from eating down one section of pasture while leaving other areas to grow high. It also aids in parasite management, allowing the alpaca rancher to rotate pastures. The downside of this is that you'll need lots of fencing and gates. However, there is more than one way to fence an alpaca. Unlike other livestock, alpacas typically won't challenge a fence. So one way to have small paddocks is to use boundary fencing for areas where you absolutely don't want the alpacas to cross (property line, mixing boys/girls, etc), while using t-posts and rope fencing designed for horses to subdivide into smaller paddocks. If the inquisitive alpaca crosses the rope fencing from one paddock to another, it's not the end of the world. Those are meant mainly to "encourage" grazing one side of the pasture as opposed to another. As mentioned, alpacas typically don't challenge fencing. Therefore the fencing is not needed to keep them in as it is to keep predators out. 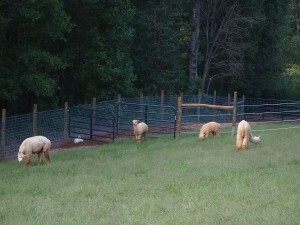 The commonly recommended fencing for alpacas in the south is 5' no-climb. You'll want the woven wire as opposed to welded wire for longevity. Red Brand is a manufacturer that can be found at tractor supply and other farm supply stores. In addition to the 5' no-climb, we also put electric wire at the top and bottom to discourage coyotes and stray dogs from trying to enter the paddocks. One of the top predators of alpacas in the United States is stray dogs. As you're moving your herd around, you can't have too many gates. When trying to get things done quickly, it's much easier to build a second (or third) gate once than to spend years having to walk around a pasture to get to the one gate. Your alpacas will love you for the pasture, but your ability to address health concerns and perform farm maintenance will be made much easier if you include dry lots in the design. Dry lots are smaller areas of dirt, small gravel, or ground limestone that do not have grass growing. In a dry lot, your alpacas will be provided hay as forage. Some farms raise alpacas on only dry lots, without any pasture. 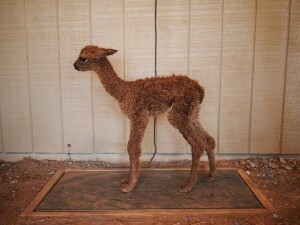 If your alpacas have a health concern like parasites, you'll want to put them on the dry lot while deworming them. This helps to keep the parasites out of the pastures where they're more easily transmitted to new hosts. You'll also want to put your alpacas on the dry lot whenever you fertilize your field. In the winter months while the grass is dormant and you're feeding hay, dry lots can become home to the alpacas, allowing the pasture to "rest" during the winter months. Alpacas are easy to care for. They mainly need grass and water. One goal of your facility design should be to minimize the amount of unnecessary work that keeps you from doing the fun stuff. Automatic waterers can be a lifesaver. They're not cheap, so make sure and build them on the boundary between two pastures so that alpacas on each side of the fence can share the same waterer. In Peru, alpacas live in the wild without shelter, however heat in the south dictates that you have shelter to provide shade in the summer. Because we have relatively mild winters in the south, an enclosed barn isn't necessary. 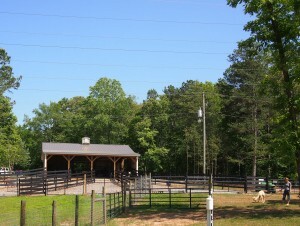 Many alpaca farms provide three sided pole-barn type shelters or even just a covered shelter with no siding. When building a barn, keep in mind that a general rule of thumb is always build a bigger barn than you think you'll need. Everyone outgrows their barns. You'll want to keep in mind a farm office or farm store, places to store hay, room for herd health (scales, shearing, etc), and possibly temporary birthing stalls. You'll ideally want power and water in your barn. There are two types of lightweight livestock panels. One type is purchased at places like tractor supply and those 10' interlocking bar panels are great for building catch pens in a pasture or assembling a temporary pen for a fair. 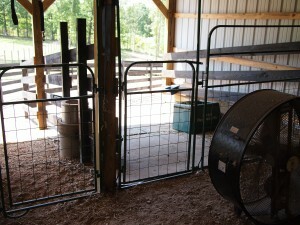 Another type of lightweight interlocking panel is even lighter and can be used inside the barn for stall fronts, herd health, cria creeps, and in other areas. Both types of panels are great for quickly setting up, tearing down, and re-configuring enclosures. The first is used mainly outdoors and typically only for shorter supervised duration's, while the latter is more suited to becoming a part of your fencing solution inside the barn. Having seen many horse farms where owners spend lots of time driving from pasture to pasture during feeding, we decided to design our farm layout so that the alpacas all come to a central location for food, water, and shelter. We have main pastures that are enclosed with 5' no climb, subdivided for rotation, that each lead to a dry lot off a single barn that was built as a 3-sided enclosure. 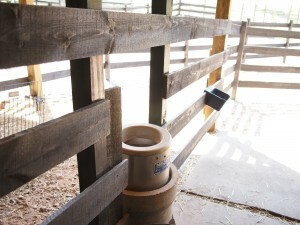 Hay, food, and automatic waterers are located in the barn stalls, and the stall fronts are lightweight livestock panels that are easy to reconfigure. To make herd health easier, we built a wood case at ground level so that we could drop the livestock scale into it. That makes weighing easier because the scale is already at ground level. We also put 9' bar gates on barn openings so that the inside of the barn is not only another work corral for herd health but is also a second line of defense if stall gates are not secure.